If you want to find the best raccoon trap that you can purchase nowadays, you have come to the right place. We have examined the quality, value, and reliability of some of the critically-acclaimed options in this line, and we have concluded that the Trapro Large Live Cage is the product you ought to get. 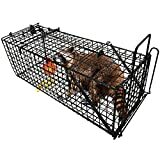 The 32″ x 11″ x 13″ dimensions make it a perfect multi-purpose cage that can trap not only raccoons but also opossums, rabbits, and other similar-sized animals. The galvanized steel construction is built to last and it will resist corrosion and rust. What’s more, the sensitive trigger guarantees that the single door will snap shut in a matter of milliseconds so that the raccoon has no chance of escape. If you can’t find our first choice available, but you are determined to get a good raccoon trap, the Havahart 1079 Large is a great alternative. Thanks to its generous size, this option is ideal for trapping opossums, cats, rabbits, as well as other similar-sized animals, not just raccoons. It boasts a space-saving design that is easy to fold flat and is constructed from highly-durable galvanized steel for maximum resistance. We found a few reports that mentioned that the cage features sharp edges. It can be very easy to hurt yourself while setting it up if you are not careful. On the whole, this is the perfect cage for people that want to get a comprehensive solution for all of their pest problems. Unlike other options that require assembly, this model comes fully set up and ready to use out of the box. It is designed for higher catch rate and fewer escapes so that you won’t have to try catching that elusive raccoon for days. The cage is rust and corrosion resistant. The construction of the cage is not of the best quality and some users have reported that stronger raccoons may be able to break it and escape. This is the ideal cage for capturing raccoons, groundhogs, and opossums in a humane manner. The collapsible design allows you to store it easily during the winter period. The smooth internal edges and the wire mesh exterior make this unit a safe and humane choice as it can capture a wide range of stray animals with minimal chances of injuring them. The wire mesh leaves enough room for raccoons to reach in through the sides to get the bait. You’ll need to be careful where you place the food. All things considered, this option is excellent for trapping any unwanted animals thanks to its simple design. It can be challenging to find the best live traps for raccoons and for this reason, we have prepared a list of top-rated products so that you can select the one that best suits your needs. The options below have garnered mostly positive feedback and stood out thanks to their quality and reliability. The large single door cage is perfect for anyone seeking to capture unwelcome animals such as raccoons, opossums, rabbits, groundhogs, and other pests that like to ravage your garden or home. The trap cage is designed to fix all your problems in a safe and non-toxic way, and as a plus, it is very easy to use. The collapsible design enables you to fold it flat after it has done the job so that you can store it without it taking too much space. As is expected from a quality purchase, the unit boasts a durable construction that features the use of sturdy galvanized steel for maximum resistance to corrosion and rust. 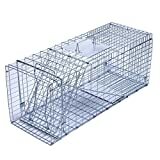 To make things even better, we found numerous reports from customers who said that the trap works just as well for smaller animals so that you can use it to get rid of unwanted rats or other small critters that like to roam around your house. The escape-proof design features a sensitive trigger that will snap the single door shut in a matter of milliseconds so that there is no chance of the animal escaping. The large handle guard will protect your hands during transportation so that you don’t get scratched or bitten. The smoothed internal edges add extra protection to prevent injuries to both the animal and yourself. Owners were very satisfied with the simplicity of this model as it is very easy to set up and then use to relocate the animal you’ve just trapped. One other advantage of going with this brand is that the customer service is very quick at solving your problems or answering all the inquiries that you may have. The user manual features a very short instruction guide with a single picture and for inexperienced buyers, the instructions can be very difficult to follow. This versatile purchase can trap a large range of animals including raccoons, skunks, opossums, muskrats, armadillos, cats, and groundhogs. The trap comes fully assembled and ready to use which makes it a perfect choice for people that don’t want to be troubled by a lengthy and complicated assembly process. The trap is made of sturdy rust-resistant wire mesh with steel reinforcements for increased durability in the field. The sensitive triggers and the spring-loaded door will help you catch animals quicker as they will have no time to react and get out of the cage before the door closes. The unit is also very lightweight which allows users to maneuver it easier even when there’s a raccoon inside it. As a plus, the trigger rod is found on the outside of the trap which means that whichever animal you capture, it will not be able to damage it and escape while inside the cage. The internal edges are smoothed which will prevent the animals from injuring themselves while exploring the cage and trying to get out. The galvanized steel construction helps fight off corrosion and rust and will help guarantee the durability of the option so that you can use it for many years to come. The door and large handle guard are built from similarly strong materials and will protect you during transportation since the raccoon will be kept securely inside. The extremely sensitive trigger and the smaller mesh opening will help prevent cunning animals from stealing the raccoon trap bait. Customers are very pleased with the fact that the trap comes fully assembled. Bigger animals can wreck the trigger plate and render the product unusable, so you might want to be careful where you use it. Similarly, some buyers received their unit in bad shape but we believe this might have more to do with the shipping process. If you are looking for a cheap raccoon trap that can keep the animal protected until it is time to relocate it, this is a humane solution to all your problems. It features sturdy rust- and corrosion-resistant wire mesh with heavy-duty steel reinforcements which will guarantee long-lasting performance. Another advantage of this model is the fact that it comes in a collapsible and easy-to-store design. Thus, all you’ll have to do is pull it open and it will be ready to use. In the winter months when chances are you won’t need it, you can collapse it against and store it smartly since it won’t need too much storage space. The pressure plate design makes it effortless to bait neighborhood raccoons, flying squirrels, feral cats, mice, bobcats, rodents, and many others. Similarly, the trigger rod is placed outside the trap so that the animal cannot use it to escape while inside the trap. Customers are very pleased by the quality of the customer service since the seller is quick to resolve technical problems and will replace any missing or broken pieces. The humane design means that you can rest assured knowing that you will be able to relocate the raccoon without injuring or stressing it. Overall, the trap is very easy to operate and open when the time comes to release the animal back into the wild. The versatile design allows you to capture a wide range of animals, including large rodents. For anyone looking for an affordable option that does not compromise in terms of quality and reliability, the AMAGABELI GARDEN & HOME stands out from the crowd. The unit features a bait hook which, while not sharp enough to injure an animal badly, in the case of cats which like to trash about once caught, it could scrape their skin. Thanks to its patented design, this option manages to trap pests easily and quickly since it allows for simple one-hand operation. The unique design makes the trap safer for the animal but also for the trapper. The handle will protect you from any scratches or bites so that you can transport the raccoon safely. When the time comes to release the animal, the easy open handle at the front of the trap allows you to open the trap with just one hand. What’s more, to increase the versatility of this option, the 2 pack value set includes two traps, one measuring 24” and the other 32” so that you can catch small to medium size animals. Similarly, since durability matters greatly when looking to purchase this type of product, Neocraft has equipped both models with a rugged steel body that is covered with a grey hammertone powder-coat finish meant to prevent rust and corrosion. The manufacturer is a firm believer in the quality and reliability of its products, which is why owners get a 5-year guarantee and in that time they can reach out to it if they happen to encounter any issues. This value set includes 2 traps, the 24” for small size animals and the 32” for medium size animals, making the set capable of trapping all the pests you may have around the home. The top handle is secured and covered so that you don’t risk having your hand scratched or bitten by the raccoon you have just trapped. The trap is very easy to use, thanks in part to its one-handed open process and the patented design. Some reviews mentioned that the locking mechanism is not perfect since smart raccoons can figure out how to use it to escape. 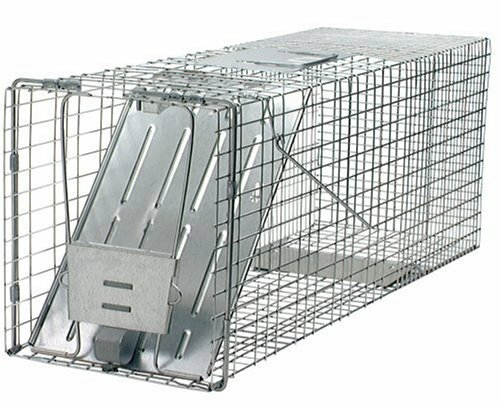 If you are looking for a reliable, effective, and durable trap, then the 1045 Two-Door won’t disappoint seeing as it has been designed by trapping experts to offer the best performance for the price. It is carefully constructed using a fine-tuned trapping mechanism that targets large animals specifically so that you can eliminate false triggers or trapping the wrong animal. The doors are spring-loaded and that helps deliver effective captures with little chance of the pest escaping once it gets in. You don’t need to be familiar with how traps work in order to operate this unit since its design lets people of all experience levels capture, transport, and then relocate the animals to safer areas. Since the unit boasts two spring-loaded doors, the animals will be able to enter from both directions, which helps double your odds of a successful catch. The size of this model makes it ideal for trapping raccoons, groundhogs, stray cats, opossums, or other similar-sized animals. The handle guard combined with the solid metal doors will help protect you from contact with the animals so that you won’t have to fear that aggressive specimens might injure you. Similarly, the strong door locks will keep the pests in the cage safely while the rolled edges will prevent them from injuring themselves during the transportation process. The two-door trap will increase your odds of a catch since it will give animals a clear and unobstructed line of sight. In terms of durability, Havahart uses premium materials that are intended to handle harsh weather and unpredictable animal behavior. The triggers are very sensitive, meaning that sneaky animals will no longer be able to steal the bait and then leave the cage freely. Customers have reported that despite the manufacturer reporting that the unit can trap armadillos, in practice, these strong animals can bend the trap door and amble away. There is no doubt that the stand-out feature of this model is the patented time-release door which makes this one of the first ever traps with time-release capabilities. Thus, if you don’t want to risk getting injured when relocating aggressive animals, the timer on the door can be set up to 5 minutes. The 5-minute timer will give you more than enough time to get to a safe distance before the door opens. The hands-free release solution has garnered positive feedback from both seasoned and first-time trappers. The handle features a protection guard and will allow you to transport the trap away from your body. As far as the quality of the construction goes, it should come as no surprise that similarly to other Havahart models, this one boasts the same premium materials designed to endure even the harshest environments. The large size trap is ideal for raccoons, opossums, and even groundhogs. You don’t need to have ever used a trap before since this unit features a simple design that allows anyone to capture, transport, and then release the animals with great ease. It is very easy to release animals in just three easy steps that include setting the timer for up to 5 minutes, unlocking the latch on the release door, and walking away to a safe distance. The cage is constructed using sturdy and rust-resistant wire mesh with steel reinforcements that add further durability to the trap for years of reliable performance. As far as user feedback is concerned, we are happy to report that the vast majority of owners had a positive experience with this model. The metal lining can be hard on the little claws and paws of the critter if it begins to panic, and some buyers have mentioned that some raccoons have managed to injure themselves. If you are looking for professional raccoon traps for sale, going for a Tomahawk model is a sound choice since this brand is well known for the quality, reliability, and performance of its products. This model uses the same great design, specifications, and materials as all of its award-winning traps in the Professional Series. This is a versatile option that can be used by hunters and outdoorsmen to trap a wide range of animals for a large variety of interests. Apart from raccoons, you can also use it to catch feral cats, woodchucks, armadillos, groundhogs and any other similar-sized animal. Once a critter is trapped, the easy release door allows it to be transferred easily and safely to the holding or transfer cage. This feature will allow you to keep your traps in the field by moving the animal you have caught from the trap into the transfer cage. The easy trap baiting allows you to place the bait at the back of the trap with the release door removed so that you no longer have to reach through the front and risk setting off the mechanism. It is very easy to operate the trap, and this is one of the main praises that many of the people who have bought it mentioned in their reviews. Relocating the animals you have just caught will now be effortless since the easy release door offers a straightforward and safe solution. The cage is constructed using 4-gauge galvanized wire mesh which helps confer this option the durability it requires to handle even the most energetic critters. As is expected from a brand that is recognized for premium craftsmanship, the price of this option is quite high and not everyone will be able to afford it. For anyone looking for heavy-duty but affordable raccoon cage traps, Duke has an option that will surely satisfy your needs. The 30″ x 12″ x 12″ product dimensions make this option work for cats, woodchucks, armadillos, and other similar-size critters. The large size makes it perfect for people that want a humane trap that won’t injure the animal. The unit features a mesh cage with steel rod drop doors to help effectively catch and trap wild animals that may roam around your household. For increased durability, the cage features a green powder coated finish, the same solution that has been used extensively for fur trapping. The trigger mechanism is very simple yet durable enough to handle even the smartest and most powerful critters. As is the case with most Duke products, this model is designed to provide exceptional durability and performance with no harm to the animal. One of the key praises that customers had about this model was its durability and reliability which allowed them to catch even the most elusive critters. The Duke model combines a heavy-duty design with an affordable price making it the go-to choice for anyone that does not have a big budget. You can use this model for a wide range of pests as we found reports of the unit trapping woodchucks and armadillos successfully. While the heavy-duty construction is perfect for animal control professionals, the simple design makes it just as easy to use by amateur or inexperienced trappers. The unit offers very little protection from aggressive raccoons which can make the process of releasing them back into the wild not only difficult but also a bit scary. The trap could have been improved with minor modifications to help prevent stronger animals from tipping it over. The LAT-001 model uses an innovative quick-shut sensitive trigger that will offer an efficient way for owners to catch raccoons, groundhogs, opossums, and other large pests. It is made of high-quality steel mesh which features a rust-resistant finish to ensure that this trap is more than capable of handling even the most intense weather conditions. When you are not using the trap, you’ll be able to store it in your garage, attic, shed, or other storage space since the collapsible design allows it to be stored almost anywhere. Thus, unlike other options that can take lots of storage space, you can fold this one flat in a matter of seconds and leave room for your other voluminous gear. The humane trap design guarantees that no animal will be injured upon capture which we know is a very important feature for any animal lover. You’ll then be able to relocate the critter safely so that it can continue living a healthy and happy life away from your property. The large size of the cage makes it work great for multiple species so that you can keep your household and surrounding area free of pesky animals. The new quick shut hair trigger door snaps shut in milliseconds so that there is no chance of the animal making a quick escape. To make assembling the product more manageable, the manufacturer includes a link to a video that will show you how to get the trap up and running with minimal hassle. Thanks to the use of high-quality materials, you won’t have to worry about the durability of this model and you will be able to continue using it for many years to come. While the video tutorial is a great addition, some customers would have preferred if the package contained printed instructions as well. The metal around the trap door can get bent by strong raccoons, and that might prove to be a problem down the line. The Northern Industries alternative is 32” long and has a 10” x 12” opening, making it ideal for trapping raccoons or other similar medium-sized animals. The product comes with a ½” x 1” mesh, which surrounds the back third of the trap as well as the bottom of the back door. The mesh will prevent the critter from stealing the bait without setting the trap. Similarly, the product comes with a special guard under the handle to protect you from getting bitten or scratched by the animal you have just captured. Ease of use is also a focus, which is why the T101232R offers a quick set-up process thanks to its locking V trap door and brass roller bearing trigger rest. These features also allow the trap to work at any angle, even if it gets turned upside down. The addition of reinforcing rods on both the door and the rear of the trap helps improve the durability of the product. The manufacturer is quick to respond to inquiries and resolve any problems that customers might have with the product. If you wish to get a reliable and high-performance product but you can’t afford to get the premium models, this alternative offers very similar features and performance at an affordable price. Customers are very pleased with the quality and reliability of this model, claiming that it is very easy to use and it can trap even the most elusive pests. The trap uses only the most durable materials which help it achieve great durability even in the harsh weather conditions. There’s no need to worry that you haven’t placed the trap properly since this model works at any angle, even when it is upside down. The door closes very fast and some customers fear that might lead to injuring animals that have not gone fully into the trap. If you’ve gone through numerous raccoon trap reviews and you haven’t yet found an affordable model capable of meeting your requirements, you might want to take the time to consider the ZENY alternative. This is one of the most affordable options on our list and it does not compromise in terms of durability, quality, and reliability. The trap is 32 inches long and features a single 12.5 by 12 inches door. The sturdy, high tensile, wire mesh construction will keep any neighborhood pest contained while the smoothed internal edges will prevent any injuries from occurring to it. The wire mesh is rust-resistant so that you can leave it outside without having to worry that it will get damaged. You can use this option to trap many types of medium and small size animals. The manufacturer recommends to use it for anything from raccoons, bobcats, and possums, to smaller critters such as squirrels, rats, weasels, chipmunks, and many others. The powerful spring loaded door provides security and protection not only for you but also for your unwelcome visitor since it will prevent it from escaping while keeping it safe inside. The trap is built specifically to be an effective and easy-to-use solution designed to help you catch small to medium sized animals. You can use this option for both indoor and outdoor use, making it a great tool to help you get rid of any troublesome visitor you may have inside or outside your house. Releasing the captured animals back into the wild is very simple, as all you will have to do is reset the trap manually and then the door will open. This is a dog-proof raccoon trap and you can even use it around children since it does not contain sprays, chemicals, or poisons. One compromise with this option is that is that it does not feature a collapsible design. Not everyone has the time to prospect the market and go through each product specs before deciding on the lucky winner, which is why we have prepared this following buyer’s guide to help you decide. We have inspected many of the top-rated products currently available to pinpoint the features that matter the most. With the must-have features in mind, you will find it much easier to sort through the wealth of options available and focus on the ones that meet your requirements and that are worth your time. Take a look at our comprehensive buyer’s guide and see for yourself. Which type of trap should you choose? One of the most common types of traps used for catching raccoons is a live cage trap. The reason why people prefer this model is because it offers a humane solution to your problems so that you can later relocate the raccoon without lowering its survival chances due to injuries. Another thing that makes these traps unique is the fact that you can see the animal you have in your cage before there’s any chance of hurting it. Thus, if you accidentally catch the wrong critter or somebody’s pet, you’ll be able to release it without causing it any physical harm. Experts don’t recommend you use a raccoon hand trap, also known as paw grip trap. These are very inhumane since they basically capture the raccoon’s paw with a metal latch by using a coil spring that launches the entire process. The traps can easily injure the paw and getting a raccoon out of the trap can be an awful experience for both the critter and yourself. Similarly, electronic traps should also be avoided, especially since most areas of the country have a ban against using them for raccoons. Even if they are permitted in your area, they are considered not only inhumane but also ineffective which is why you should avoid them at all costs. The size of the trap is very important since you want to make sure that it is the right size to hold a mature raccoon comfortably but not leave it enough room to move around hectically which can lead to potential injury. On the other hand, if the product is too small, the animal might get injured by the closing mechanism. The good thing is that most products that are advertised to work on raccoons come at the perfect size for the job. A glance at the available models and customer reviews will also let you know that for the most part, an option that can trap a raccoon will also be able to capture similarly sized animals. Additionally, as you begin to examine more products, you will soon notice that some have more than one door. Unlike single-door traps, options with two doors have the advantage of catching the critter from either side, thus doubling your chances of a successful catch. The essential thing to remember with two-door traps is that you will need to get a model that is at least double the length of the classic single-door trap. This is because, for two-door models, the raccoon will enter only halfway before the door closes. In terms of materials, cages are generally made of thick metal that raccoons can’t chew through. You will also need to get a trap that features rear mesh as this will help prevent the animal from cheating and reaching to get the bait food without entering the trap. While there are many guides that can help you learn how to make a raccoon trap by yourself, most of the products on the market come with extra features that are not present in homemade options, not mention that they are also much more efficient. The perfect trap should be as quiet as a mouse as otherwise you risk frightening the raccoon with the loud noises of the trap closing. A frightened animal is more likely to become unpredictable and harm itself. Similarly, make sure that you get an option that is easy to use, especially when it comes to relocating the animal. If you are afraid that the raccoon might scratch or bite you when you’ll release it, you can consider getting an option that allows for hands-free release. Such a product will come with a timer on the door that will open the trap automatically once the timer has hit zero. This is a perfect option for anyone that does not feel comfortable or safe around wild animals. Finally, you should be aware that catching a pesky raccoon is not always easy, and if you don’t succeed at first, chances are that it’s not the fault of the product. You shouldn’t feel discouraged since often times it can take a few days before you are successful. To help improve your chances of success, you can try a new location and maybe some different baits.